Sometimes when I’m knitting A Cardigan for Arwen, I look down at my fingers and I’m shocked to see them flying. The knitting picks up and just starts roaring past. The needles go exactly where they’re supposed to, stitches don’t drop anymore, and the sweater gets longer. The yarn is racing through my fingers, weaving itself together at a brief nod. With every row of Arwen I come closer to flitting through dense foliage, blending into the forest. The rich sunset of Rhodesian Malabrigo Worsted glows in satisfaction. It’s like knitting molten glass. I measure with three different implements before I admit I’ve come this far, before I allow myself to bind it off reverently. It’s the entire back of my own sweater, and I can’t believe I knit it myself. I should celebrate. No, I haven’t even begun the terrifying cabling, there are no sleeves, I can’t wear a knitted rectangle, however soft and golden. But this is what I always do to myself. I don’t know how to rest on my laurels. As soon as I accomplish something, I’m searching for the next to-do. Sometimes at the reception for the accomplishment. And, ah, knitting. The list of items in my queue grows several times a day. There’s no “done” in knitting, not for someone like me, who can’t breathe if there are less than six projects on hooks and needles. No “done” in writing, either. Not for me. I have as many books in the pipeline as I have knitting projects. Maybe that’s what’s so beautiful about knitting this sweater back. I really enjoyed the process, even while I was complaining about the miles and miles and miles of stockinette. It really opened my eyes to the sensuality of knitting — Malabrigo yarn has amazingly deep color, it feels like silk, and it has a slightly musky smell as if it hasn’t forgotten the sheep it came from. 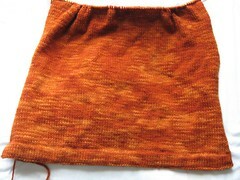 As the piece knit up, it developed a slight haze, changing the color as I made the sweater. So many people, acquaintances and friends, complimented the evenness of the stitches, the drape of the fabric. I feel confident in my abilities and I really enjoy the process of knitting now. I can’t believe it took me almost thirty years to find this hobby. I guess all I needed was the right yarn. Congrats on your progress. I’m sure it’ll be beautiful. And with that attitude, it sounds like you have more, even more beautiful items in your future!